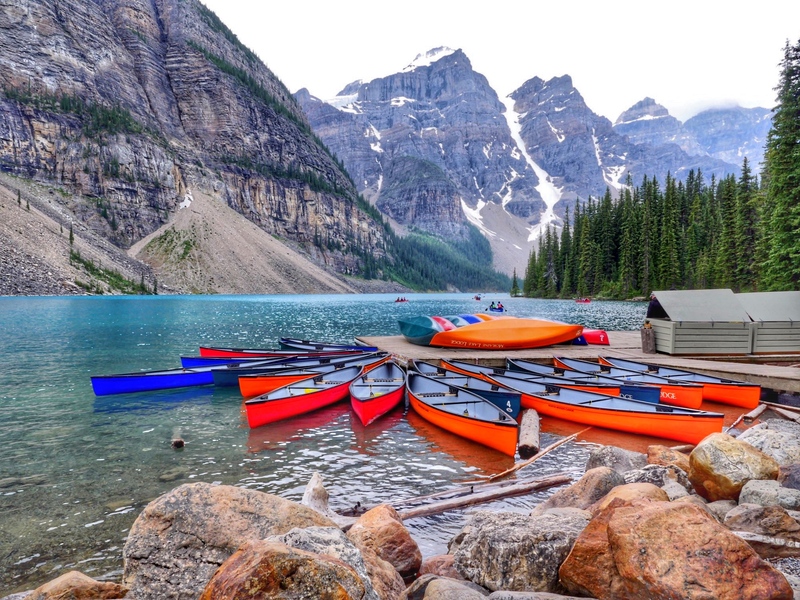 Living in Toronto sometimes leads to a strong desire to escape the city. When I need a quick getaway from life in the city with or without my kids, my go to place is Blue Mountain Resort. Located less than 2 hours from Toronto, Blue Mountain is my home away from home. A lot of people have been asking where I prefer to stay in Blue Mountain. 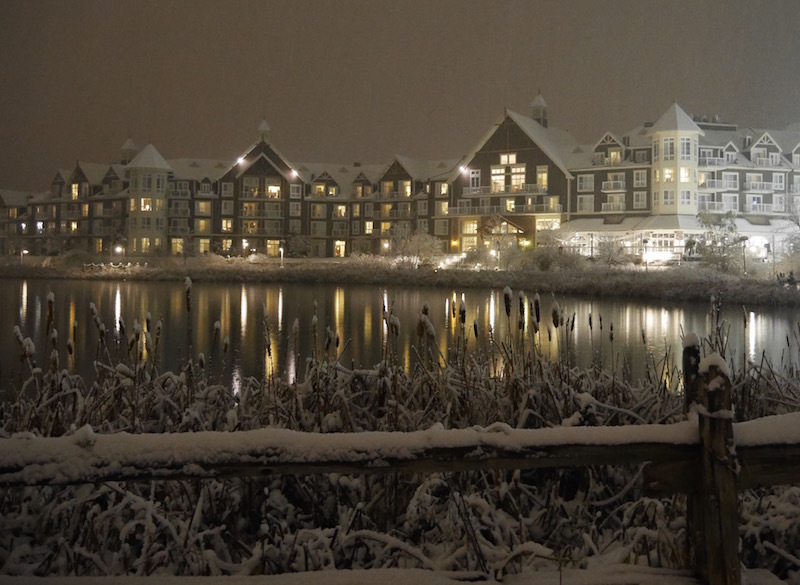 My choice of Blue Mountain lodging is clear, I absolutely love to stay at The Westin Trillium House. Here’s why. In my books, there are many things that make a great hotel. Although I tend to prefer luxury hotels, I’ve had my share of disappointments when service or amenities in highly rated hotels were lacking. I’ve also fallen in love with not-so-luxury hotels due to great service, good location or fantastic pools. 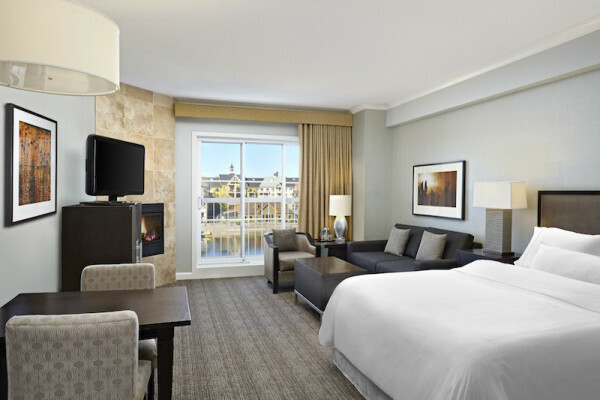 The reason I love the Westin Trillium House is that its a great luxury hotel that holds up to high standards on all accounts. I’ve probably stayed at the Westin Trillium House 6 times in the last 2 or 3 years and I’ve never left disappointed. During my stays at the Westin Blue Mountain, I’ve stayed in pretty much every room category they offer. When with the kids, I tend to book a deluxe room with a queen bed and sofa bed. Although I love the suites, the kids are I are never in the room and so we simply choose the lowest price category. Each night, the turndown service includes setting up the sofa bed and the kids love the novelty of sleeping on a bed that minutes ago was a couch. It’s when I am not with the kids that I like to step it up a notch. 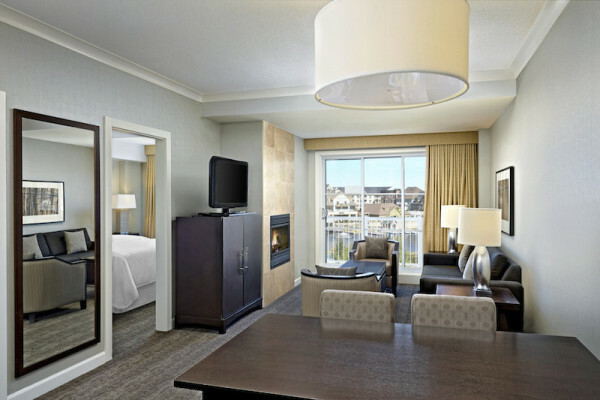 Every suite I have been in at the Westin Trillium House is simply gorgeous. The suites are equipped with everything you need to not have to leave the room which is usually my preference. From stovetops and coffee makers to gorgeous fireplaces, big bathrooms and balconies overlooking the village, its pretty hard to convince yourself to go outside. Beyond the rooms, the service I’ve received at the Westin Trillium House is the highlight of every stay. From the minute you pull up to what may be the world’s most helpful valet team to the moment you leave, no request is left unanswered. I feel as if a weight is lifted off my shoulders every time I step into the lobby of this hotel, as I know we will be well cared for and looked after. On our last stay, we forgot a few things in our car. Dreading going outside, we called for the car. The person answering the phone asked if we had forgotten something and promptly went and retrieved our items. 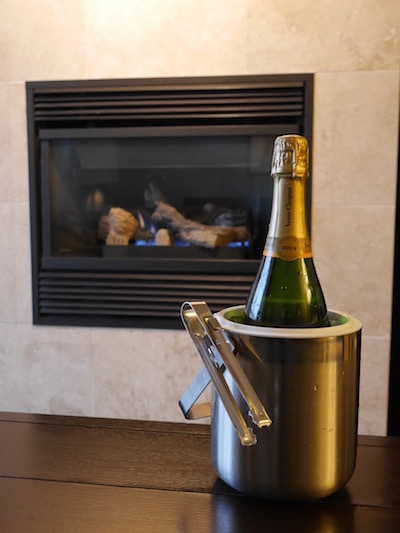 Every item we were missing was delivered to our room within minutes while I sat enjoying champagne by the fireplace in my pyjamas. Hotel food can be very hit or miss. Not at the Westin Trillium House. The hotel restaurant is an Oliver & Bonacini and the food is fantastic. The staff is used to dealing with children and crowds and handles it all flawlessly. The best part is that the room service also comes from O&B so you don’t need to leave the room to enjoy quality made-to-order meals. In addition to the giant lobby and kid’s play room, the most loved amenity at the hotel is clearly the pool. Open year round, the pool is kept clean and at a perfect temperature. 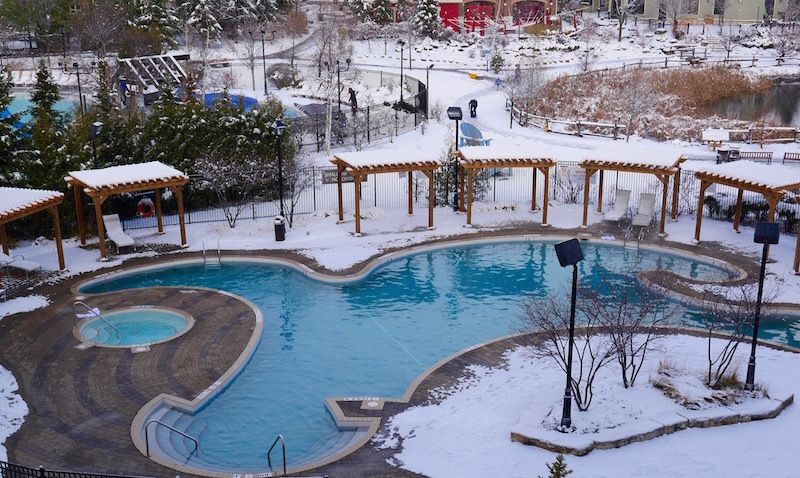 On our last visit, we got to experience this year’s first snowfall and there was no better place to see it from then the hotel’s heated pool and two hot tubs. Although my kids are content just staying at the Westin Trillium House pool, the hotel is right next to a very cool waterpark. Plunge! Aquatic Centre has indoor and outdoor pools, a rope swing, slides, and a splash pad. It’s worth checking out if you are visiting with kids. 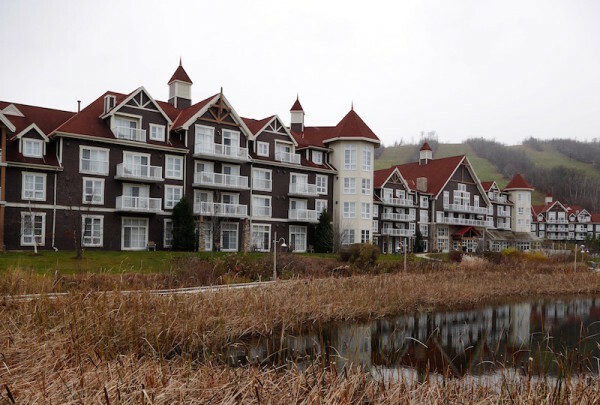 There is so much to do in and around Blue Mountain resort that it really is a year round destination for our family. We love to walk the mountain in the summer, play mini golf and climb the rock wall. In fall and spring, food and shopping keeps up busy. Winter, of course, is a playground of ice and snow perfect for skiing and skating. Whatever time of year you visit make sure you take your kids on the Ridge Runner Mountain Coaster. It’s a ride the whole family will enjoy. 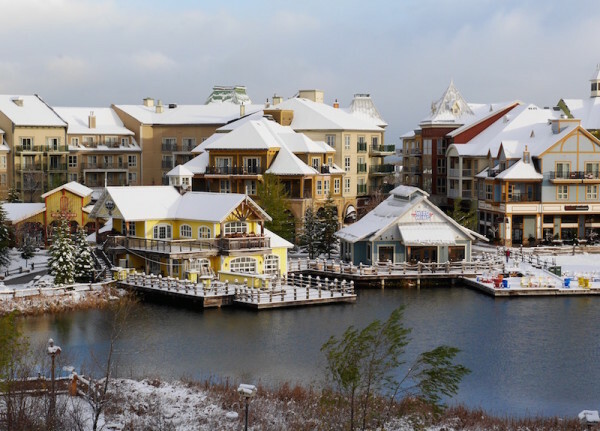 Due to its in the village location and quality, the Westin Trillium House is and will continue to be our top choice for Blue Mountain lodging. Maybe we will see you there. Love the look of this place. I haven’t been up to Blue Mountain in decades quite literally but what a great looking place to get away from Toronto.